Every director some day gets around to directing Woyzeck by Georg Büchner... an unfinished early expressionist play that reads more like a screenplay in fragments. 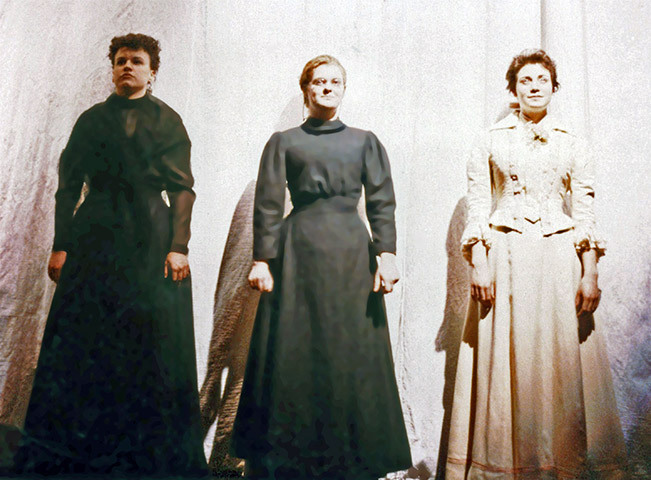 I was drawn to this play in drama school... its dark and dreary atmosphere haunted me for years. 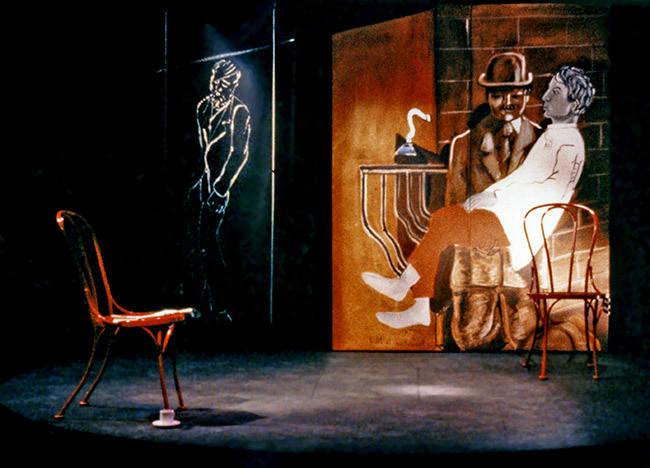 When only 23 years old, I dared to propose this play to the Walterdale Theatre, an amateur community theatre company in Edmonton. What audacity! Imagine my surprise when the Artistic Director, a very kind and polite Irish gentleman, said YES. 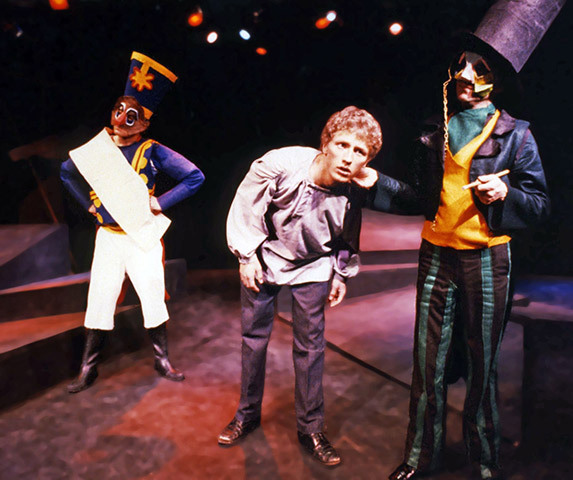 That was the beginning of months of depression and tears galore due to the subject of the play: a downtrodden soldier suffers one humiliation after another. 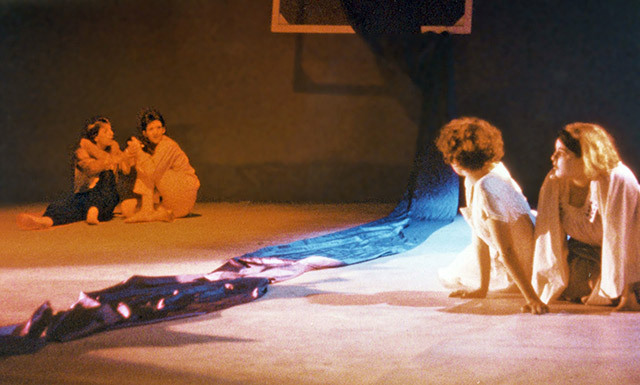 Imagine presenting a nightmare on stage... that was Woyzeck directed by Hafiz Karmali. 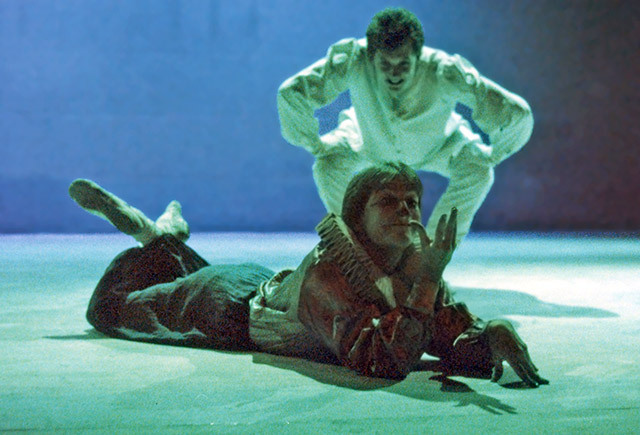 "One is in awe of Karmali's imagination ... "
Having staged the darker Büchner, I now turned to his more light-hearted, melancholic fairy-tale play Leonce and Lena. 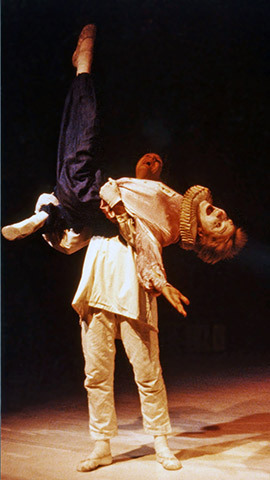 One might quibble with my definition, but Leonce and Lena was certainly lighter than Woyzeck. Here we discovered the wonders of an entirely white stage (later to become a signature of mine) and the Lighting Designer, Adam, was especially pleased with his decision to light the show exclusively with primary colours. So beautiful to discover green floor (for meadow) and shades of sky on cyc etc. 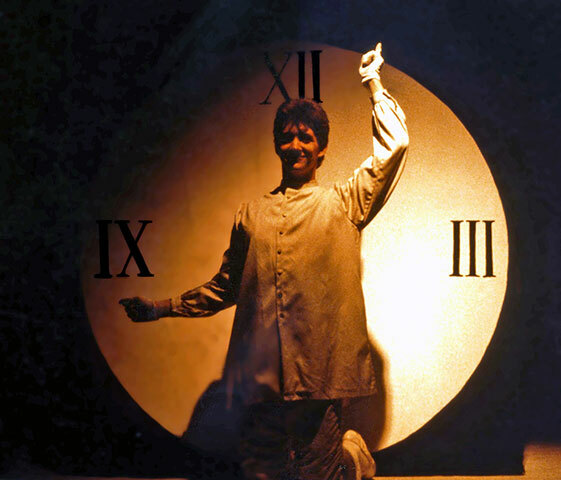 A highly stylized, masked, dance-theatre piece that later became my preferred style. 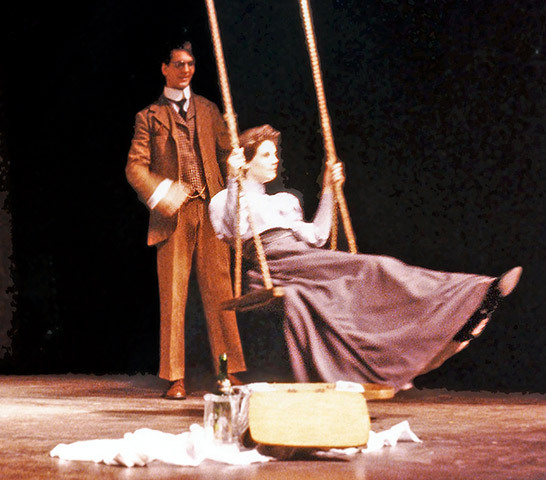 Encouraged by Mel Shapiro, my thesis advisor at CMU, to work on a more "realistic" play, I chose to explore Anton Chekhov and his emotional landscape as expressed in Three Sisters. 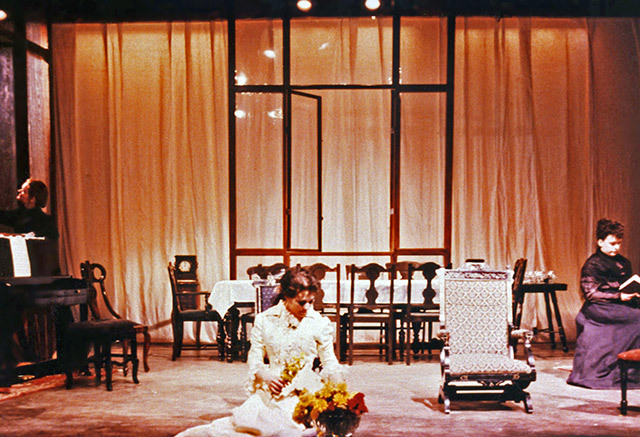 Still, I couldn't resist some stylised touches such as a billowing table cloth to suggest a dove landing on the table; an extended silence before the Solyony/Tuzenbach duel and a set design of 3 large scale windows that virtually expelled the family upon Natasha's monstrous invasion: Act I: beautiful spring day; Act II candlelit nervous tension; Act III closed in windows to suggest a tiny bedroom refuge; Act IV: windows align to suggest interior / exterior as family is expelled from its own home. 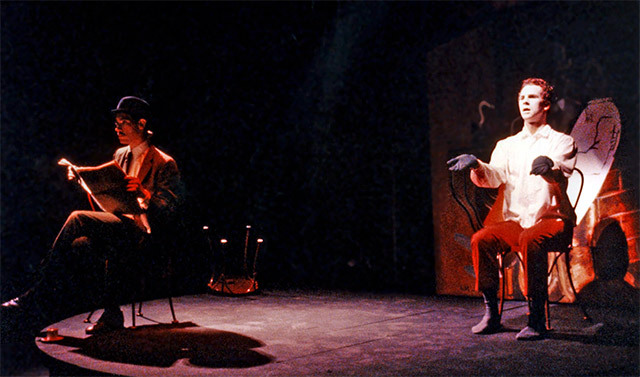 Moscow = Godot; Chekhov meets Beckett. 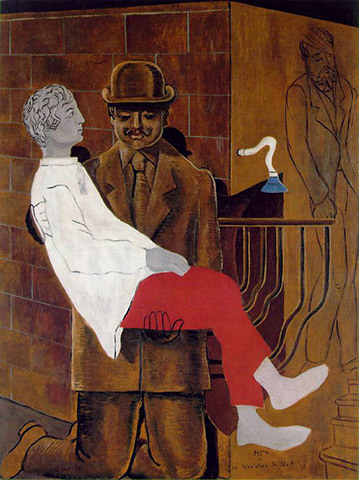 The Man with the Flower in His Mouth is a lyrical expression of a dying man's confession, staged here bringing to life Pieta, a painting by Max Ernst. The figure in the background is death encroaching. A casual conversation between two strangers at a cafe was rendered in sprechtstimme (song-speech). While most people are familiar with Lorca's great tragedies (Blood Wedding, Yerma, House of Bernarda Alba) I was drawn to his earliest, surrealistic works...some hardly ever performed...including his "Dialogues." 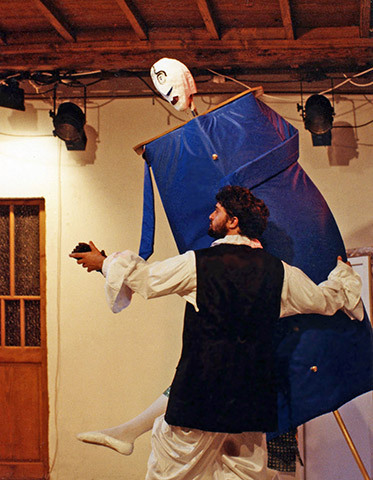 These are puppet shows similar to the kind Federico may have staged at home in doorways as a child. 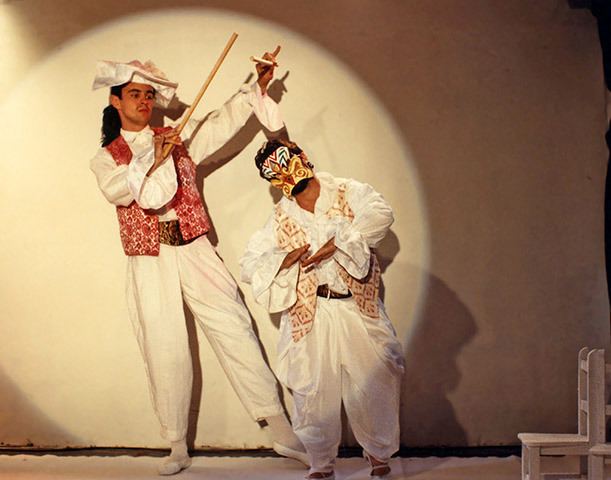 Cristobal and Rosita draws from commedia dell arte as well as silent film. We presented The Shoemaker's Prodigious Wife on a postage stamp sized stage in a boutique at the Avignon-Off Festival in France. 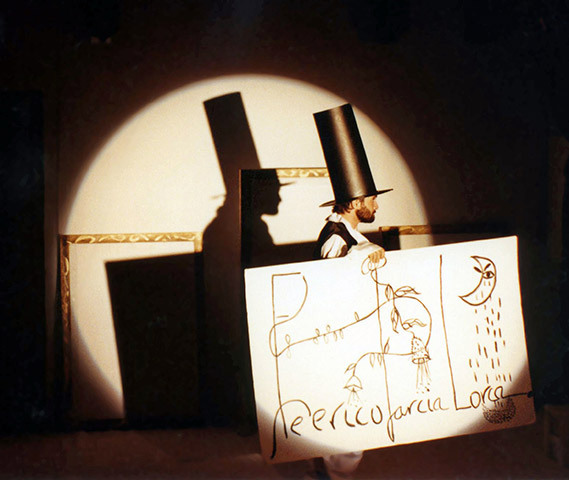 The large-scale puppets and props are all based on Lorca's very own playful drawings. During the day we paraded through the streets of Avignon to the sensual tunes of Ravel's Bolero. At night we mourned the lack of an audience to the sweet sounds of Manuel Da Falla, Lorca's favourite composer.